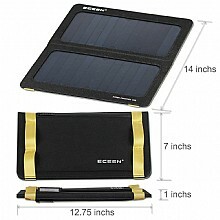 Foldable solar charger(ECE-626),,ECEEN Electronic limited. 22% ULTRAHIGH CONVERSION RATE: 13W high-efficiency mono-crystalline solar panel will offer you amazing charging speed, it won't be broken even bent up to 90 degree, ideal for emergency , backpacking, camping and other outdoor activities. The backside pouch hold your mobile phone, iPad Mini or other accessories inside perfectly. LIGHTEST WEIGHT AND ULTRA COMPACT: Only the half weight of other normal 13W solar panels - 1.0Pound. Folding size only 14 x 7 x 1.0 inches for superior portability. WEATHER-RESISTANT: High quality polyester for weather-resistant outdoor durability. Well-placed many hooks enable easy attachment to backpacks (4pcs free carabiners included) for use while on the go. 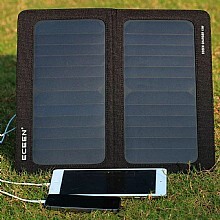 According to third party tests, ECEEN CHARGER 13W has highest efficiency of 22%, produce more juice than other solar panel pack, with only 2 monocrystalline silicon panels, but it captures more sunlight and converts light into energy more efficiently, with its 13W output, full charge your iPhone just need 4 hours! 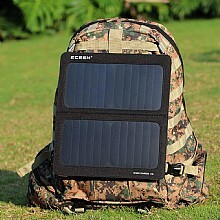 More portable than any other 13w solar panel pack, its total weight is only 1.0lb, backside pouch hold your mobile phone and iPad Mini or other accessories inside perfectly, eyeholes design makes it convenient to attach on backpack for use on the go. Monocrystalline silicon panels produced by Sunpower company guarantee its quality, it won't be broken even bent up to 90 degree, the stretchy Polyester canvas provides perfect protection for Monocrystalline silicon panels and circuit. 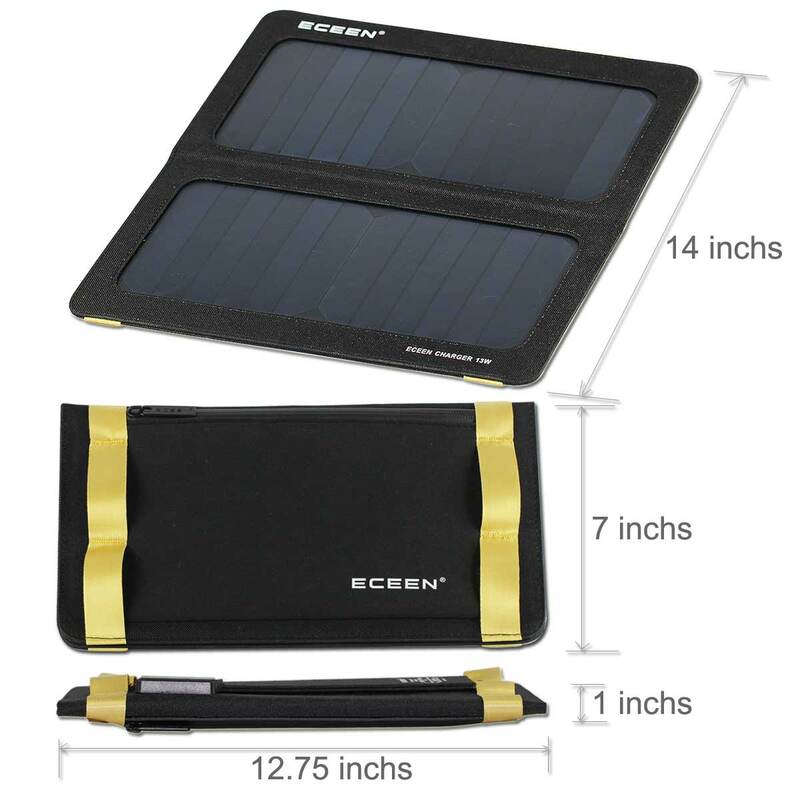 Unfold the ECEEN CHARGER 13W solar panel under DIRECT sunshine, connect your device to the USB port, then place the connected device in the solar panel's pocket or keep it out of the sunshine to protect it. I was provided an evaluation unit for testing. Here is my experience. 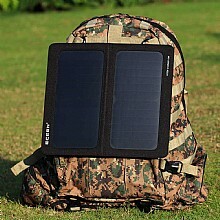 I've been using portable solar panels for a few years and it's amazing how far they've come in such a short time. Just two year ago this panel would of cost over well over $100 and it wouldn't of been nearly as efficient. Weight: 1.05lbs (with carabiners and 2 small usb cables). Performance: 4.94V @ 1.15A for a total of 5.68W. Weight: 1.73lbs (with 2 small usb cables). I really like the fact the panels are flexible, it feels so much less fragile than my other rigid panel chargers. The difference in weight is also quite noticeable. This panel seems very well suited to being lugged around, packed away, and just used overall. The other panel did score higher on the fact is has built in eyelets, that seems tougher. This panel has a bit more diversity though; you can attach it in more positions using the webbing across the back (top and bottom) and it only folds in two so it stays rigid on it's side when unfolded. The kickstand is a nice touch too and works well. One thing I really like is that its a semi-flexible monocrystalline type panel. MUCH tougher than a rigid polycrystalline type panel and lighter to boot. I wouldn't hesitate to toss this on the ground, I would NEVER do that with a rigid panel charger. As far as overall charging goes you're going to get maybe 50-100% of what you do on a 2A wall charger. On my Note 4 I get 1.15mAh on the wall charger when the screen is on, so I'm getting 100% performance in this state. When the phone's screen is off it pulls a pretty steady 1.74mAh @ 4.94V (6.68W), the Eceen charger peaked at about 1.38A but was usually around 1.25A. Almost 30% slower than the wall charger, not too shabby. It's a great solar charger for it's class (best solar charger in it's class I've used), and bested one I thought would work better for sure. If you're looking to quickly charge one device or slowly charge two devices this is the charger to get. If you want to charge two devices at the same time you're going to have to get 28W+ charger. I've used the ECEEN 13W foldable solar panel a few times so far in the week since I received it, and been very pleased with it. It seems extremely sturdy and has charged both my iPhone 6 and LG G3 almost as fast as if they were plugged in to the wall. I find it the best when laid flat in sunshine, as when I tried leaning it up at a bit of an angle against a wall, the charging was a bit slower. The panel folds up conveniently allowing you to slip it on your bag without taking up much real estate. Because we can never predict mother nature (and how much sunlight you may get on a given day), I would recommend bringing along a power bank and using that to charge your devices, and then use this solar panel to charge your power bank at the same time. 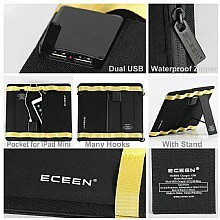 ECEEN makes very nice products and this one is no exception. 5Works great! 1.3 amps of output and possibly more! This works exactly like I hoped. Let me start off by letting you know I've only had this for less than a day so the jury is still out on the long term reliability. However, as of right now I am very satisfied. 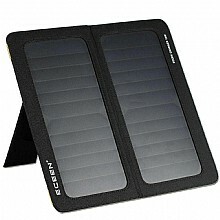 This is the second solar charger I have tried. The first was a 12w BLKBOX model sold for $49.99 here on Amazon. From that model, I received only 0.43amps @ 5 volts on a full sunny day which was very disappointing. This was far short of the rated wattage. Needless-to-say I promptly returned it. Now on to the ECEEN 13w panel. I hooked up my power meter to the panel, plugged in my Moto X, found some decent sun, and immediately got 1.3amps!! I was giggling like a sissy as I saw the charge jump 1% in about 1 minute of sun exposure. I am very, very impressed. The $59.99 price tag was fully worth it. I have yet to try the panel in full summer sun but I would suspect I might be able to get 1.6amps max. A great panel indeed. The magnet closure works great, the stand is functional, and the small zipper pocket is large enough to fit some clips, suction cups, a power meter, and a short USB micro cable. Just perfect!